Pomegrate Health was a finalist in the Career & Industry category in 2017, and the winner in 2018. It is an in-house production by the Royal Australasian College of Physicians, diving deep into stories about medicine and society. Pomegranate Health is not just for doctors, but also for other people interested in the relationship the health system has with society. Producer Mic Cavazzini took some time to share the volumes of meticulous work that goes into producing an episode of Pomegranate. 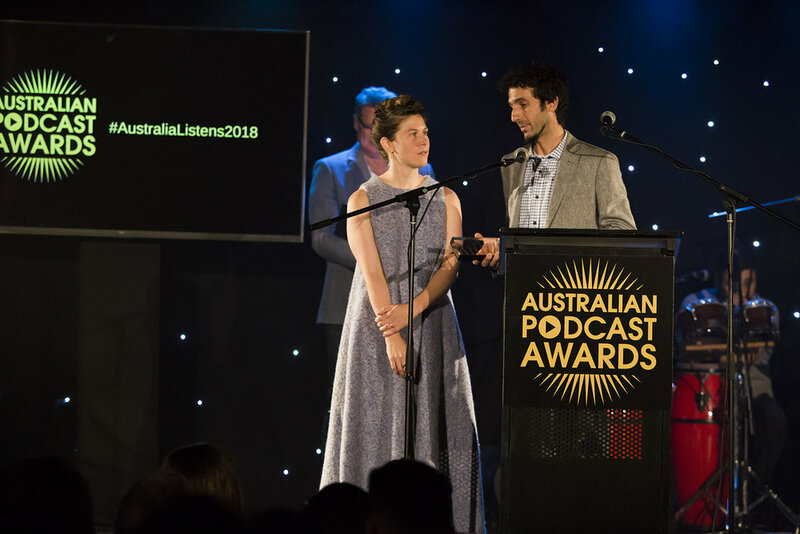 Annie Fredrickson and Mic Cavazzini accepting their award in Melbourne. Guests at the event will remember Annie's great speech, where she detailed the podcast of the taxi driver (Taxi Mark) who took them to the awards. MIC CAVAZZINI: The Pomegranate is an ancient symbol of healing on the crest of the Royal Australasian College of Physicians. Annie Fredrickson, saw podcasting as an ideal way to deliver professional development resources for busy doctors, as she had previously produced media for the Science History Institute. A year into Pomegranate Health, Annie brought me on board, as I was moving from academia to journalism by way of 2SER radio and some print publications for GPs. Given the technical nature of the content, every story takes at least a week of research to prepare. This means reading up on academic literature and clinical guidelines and boiling it all down to two pages of questions at most (which translates to about an hour of conversation). The process might be repeated for each person to be interviewed. The AKG C100S is a warm, portable and versatile condenser microphone. The Rode M3 is a cheaper alternative with almost the same dynamic range. The ZoomH6 is an incredible recorder with four inputs easily adjusted by independent dials. This is handy when recording interviews with two or three guests at time. We use Hindenburg for editing which is very intuitive and easy to learn. It has limitations, however, for the producer who wants to get very creative with sound design. Once the tape has been recorded, the challenge is getting three hours of material down to about 30 minutes. The editing takes a couple of weeks of thinning, and structuring and thinning and restructuring and scripting, and narrating and thinning. Audio drafts go back and forth a couple of times to content experts for feedback. The most important thing is to have a clear idea of the story you want before your start pre-production. This will save you a lot of time editing and writing your way to some structure. Please complete this sentence: "I feel most connected with my audience when..." When I’m listening to a final edit, the talent is making a poignant closing remark and the music starts to comes up. If I get that tingle, even though I’ve heard the tape a hundred times already, I feel like I’ve connected with the listener’s perspective. Where should new listeners start? Pomegranate Health is not just for doctors, but also for other people interested in the relationship the health system has with society. Ep33 is a balanced review of the medicinal benefits of cannabis and Ep37 is a fascinating look at challenging ethical decisions around life-supporting treatment. Newer PostMark Pesce from The Next Billion Seconds - Does your story have 'Landing Pads'?